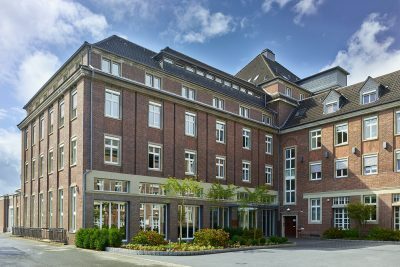 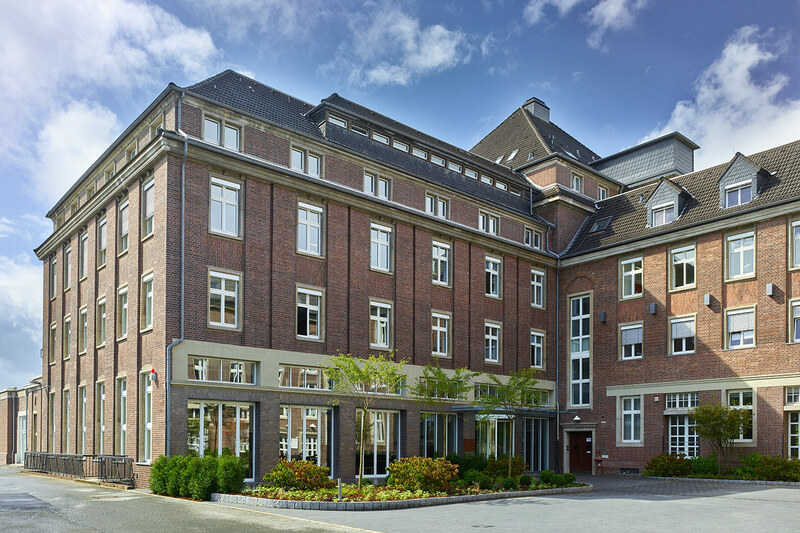 G Data Software from Bochum has designed antivirus software for over 30 years. 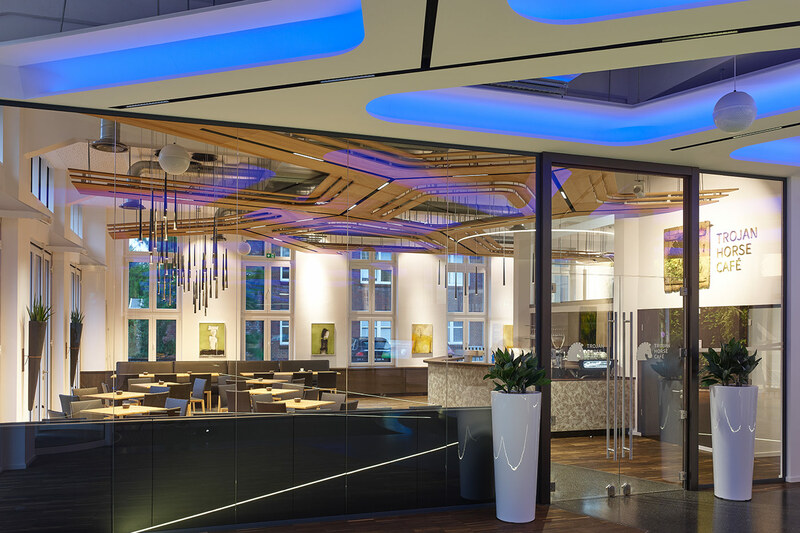 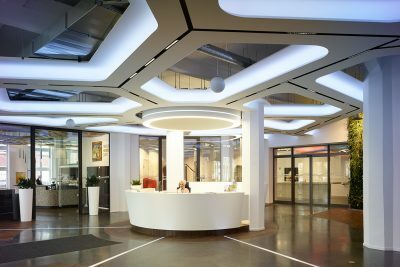 The lighting in the reception area, canteen and events space is based on an intelligent network structure, reflecting the firm’s key business. 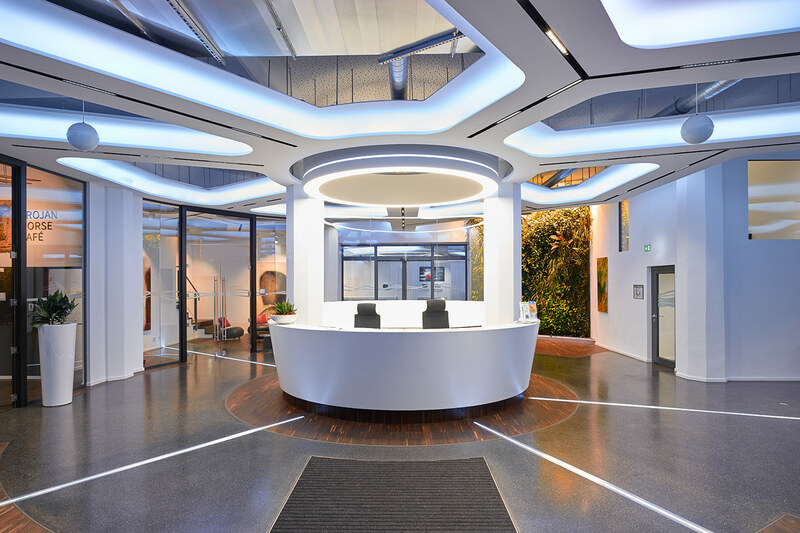 G Data’s head offices are on an former industrial site; the central entrance into the main building houses the reception with a counter. 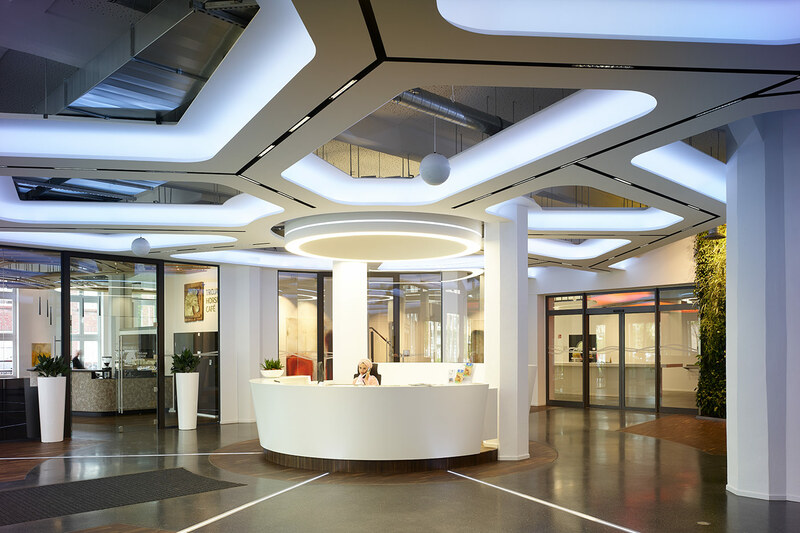 The firm’s core business is the development of IT security systems; this was the starting point for the design approach in order to come up with a functional and representative lighting plan. 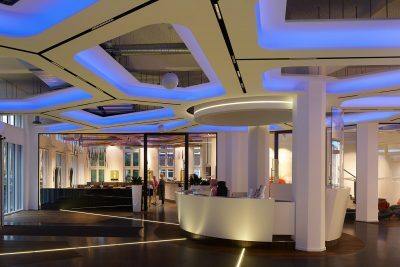 At the time the contract to create a lighting concept was awarded, the ceilings were entirely clad with sound proofing. They were replaced by a new layer, which appears as an open grid linked by individual cells. 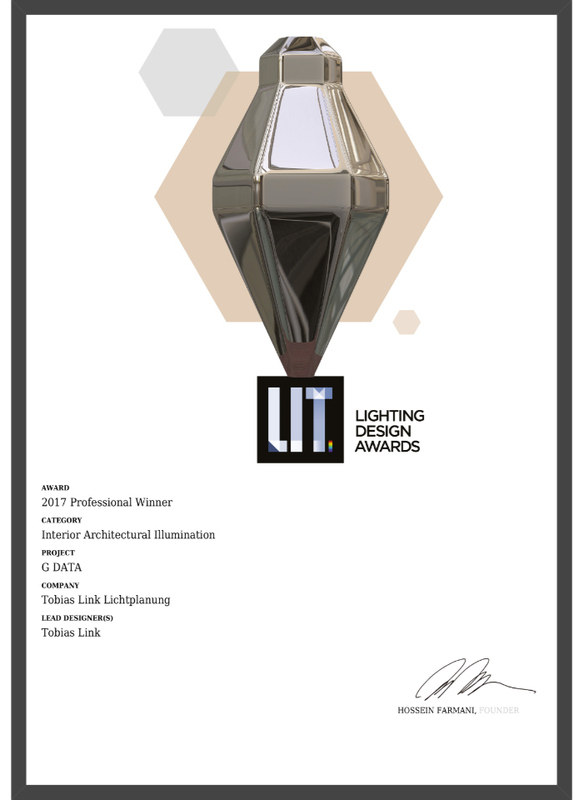 An abstract World Wide Web depicted by using complex general lighting and energising lighting schemes. 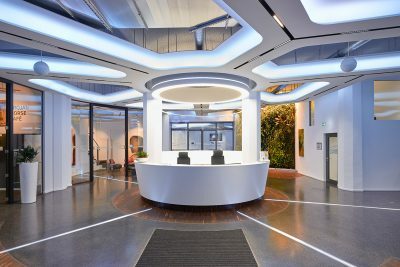 The white network structure in the reception area describes a striking architecture constructed with custom-designed moulded parts made from plasterboard . They supply two fundamental lighting components: indirect and direct light. The rounded honeycomb structures serve as cornice lighting; they provide the indirect light with integral rows of RGB LEDs and the colour temperature can be adjusted. 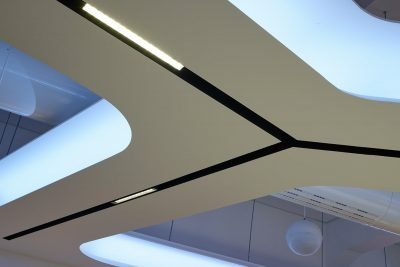 A 4-cm-wide light channel runs along the linear axes, through which direct light with two beam angles is generated. Highly efficient tunable white LED lights are used here, the colour temperature of which can be regulated. 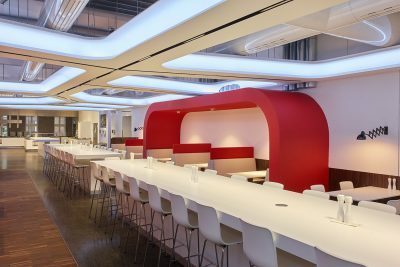 Star-like lines of light also radiate across the floor towards the counter. 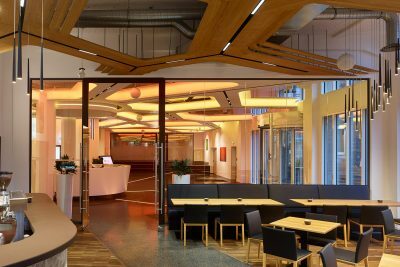 The three-dimensional ceiling sculpture leads from the reception area to the canteen in a modified form as stepped wood facets. The structure appears to float light as a feather and creates a homelike atmosphere; slender pendant lights are used for selective accent lighting and deliberately break up the branching structure. 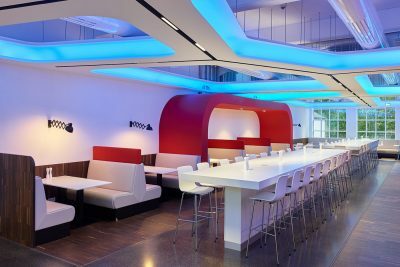 The user-friendly controls provide for four different lighting schemes: a natural light setting, which is sent information via an external sensor and transmits it into the inside; two party settings with changing colours, which use saturated colours in warm or cooler shades, as well as task lighting for cleaning and maintenance work. 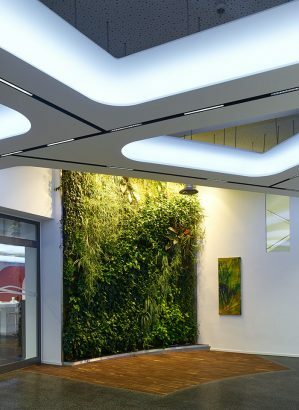 The lighting system operates biodynamically, by adjusting to the natural light and supporting people’s natural day/night rhythm in line with aspects of human-centric lighting (HCL). Cubic exterior lights are used in the events hall. They emphasise the sober industrial architecture, can be dimmed separately and the colour temperature can be varied. 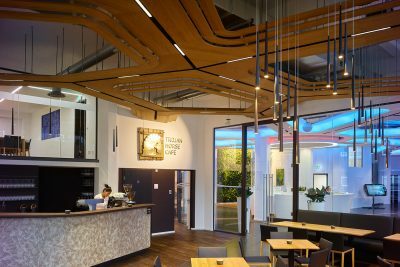 General lighting for training courses and lectures as well as changing coloured lighting moods breathe fresh life into the room as needed.